This name uses Eastern Slavic naming customs; the patronymic is Fyodorovich and the family name is Akhromeyev. Sergey Fyodorovich Akhromeyev (Russian: Серге́й Фёдорович Ахроме́ев; May 5, 1923 – August 24, 1991) was a Soviet military figure, Hero of the Soviet Union (1982) and Marshal of the Soviet Union (1983). Akhromeyev was a Naval Infantry junior officer on the Eastern Front, serving with distinction during the Siege of Leningrad front. At one point he was ordered to guard and hold a road on which the German Army would be trying to advance. Despite a bloody battle, he was able to accomplish the task. Relating the story during a meal with Secretary of State George Shultz and Ambassador Ken Adelman in Reykjavik during the Reagan Administration, Akhromeyev told Shultz that his accomplishment was not only a great sign of his patriotism, as Shultz suggested, but also was because had he abandoned the road, Stalin would have had him shot. Between 1984 and 1989, Akhromeyev was Chief of the General Staff of the Soviet Armed Forces. In that capacity, he was heavily involved in the talks which brought an end to the Cold War. However, he grew increasingly dissatisfied with Mikhail Gorbachev's approach to reforming the military, in particular his insistence on dismantling the newest and most accurate ballistic missile in the Soviet Army — the SS-23 Spider - under the tenets of the Intermediate-Range Nuclear Forces Treaty, and resigned from that position. In March 1990, he was made Advisor to the President of the USSR on military affairs. During the August Coup of 1991, Akhromeyev returned from a vacation in Sochi to offer his assistance to the coup leaders. After its failure, Akhromeyev committed suicide in his Kremlin office, hanging himself with a length of curtain cord. In addition to personal messages to his family, he left a note explaining that he could not continue living when the institutions to which he had devoted his life were disintegrating. Shortly after his death, his grave was vandalized and his corpse stripped of the uniform in which it had been buried. The culprits were never found, and it is uncertain whether it was an act of pure desecration or if the grave-robbers hoped to sell the stolen uniform or its adornments for profit. 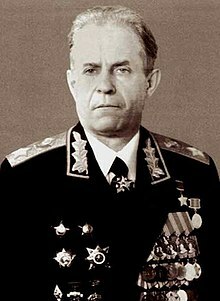 Admiral William Crowe, former Chairman of the Joint Chiefs of Staff and later the ambassador to the United Kingdom knew Marshal Akhromeyev and once called him a communist, a patriot, and a friend in that order. Akhromeyev's memoirs were released posthumously in 1992. ^ "After Words with Ken Adleman". After Words. May 7, 2014. C-SPAN. ^ a b Jackson, Robert L. (August 16, 1991). "Friend's Suicide Saddens Retired Adm. Crowe - Military: 'We grew to be quite close,' former Joint Chiefs chairman says of Soviet Marshal Akhromeyev". The Los Angeles Times. Retrieved August 30, 2009. ^ Pleshakov, Constantine (October 27, 2009). There Is No Freedom Without Bread! : 1989 and the Civil War That Brought Down Communism. Farrar, Straus and Giroux. p. 231. ISBN 1429942290. This page was last edited on 10 December 2018, at 20:26 (UTC).